Leyton Anderson and mum Dawn smile for the cameras in front of 'Leyton's Pad', alongside Miles for Men, Hartlepool College for Further Education and local businesses. 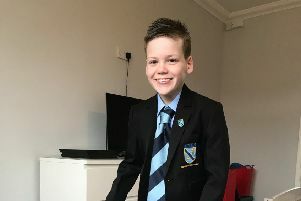 A charity has brought organisations together to provide a boy with cancer with a ‘pad’ of his very own. Leyton Anderson, five, was diagnosed with acute lymphobastic leukaemia after falling ill with pain in his arms and legs in November 2015. Since then, little Leyton has had to undergo a constant round of weekly hospital visits, chemotherapy and lumbar punctures, and faces another two years of treatment. Hartlepool-based cancer charity Miles for Men has been involved with Leyton and mum and dad Dawn and Jamie since his diagnosis, bringing him birthday presents, visiting him in hospital and taking him to the MetroCentre for a big Christmas day out. Leyton, from the King Oswy area of Hartlepool, was even guest of honour at the 2016 Miles for Men race, starting the race alongside his family. Miles for Men approached construction students at Hartlepool College and local tradespeople to help create a shed for Leyton to play in between treatments, which he was surprised with on a rainy July afternoon after returning home from hospital. Richie Griffiths, director at Miles for Men, was keen to help Leyton out, after surviving cancer himself following a stage 4 lymphoma diagnosis in 2010. Hartlepool College construction students made the shed in their free time, with flooring and furniture donated by Mark Johnston Flooring, building materials provided by MKM Building Supplies and the base of the shed supplied by D&M Landscaping. Richie said: “Everyone jumped at the chance to help out and it was fantastic that all these small companies dedicated their time and resources. Mum of four Dawn said: “It was very hard to keep this a secret from Leyton but when he saw it, he absolutely loved it. It’s somewhere where he can have fun with his friends after his treatments, and were looking forward to putting some tables and chairs outside when the weather gets nicer. Shaun Hope, head of student recruitment at Hartlepool College said: “When Miles for Men asked if our construction department could help, the students were only too happy to volunteer.